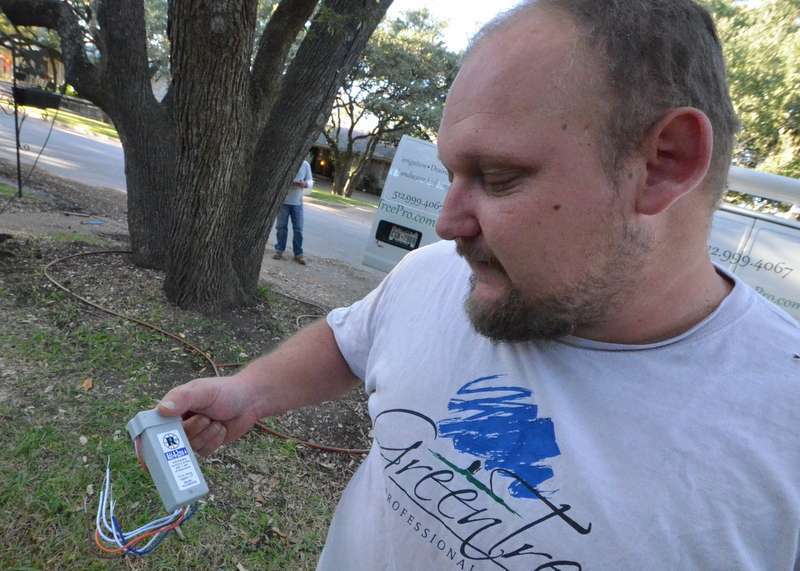 Mikel and Darynn returned to Emerald Hill to continue resurrecting the sprinkler system. This 1 December episode focuses on bringing all of the front yard zones to life. At the buried valve that he unburied, Mikel trenched for a new lateral line needed to supply a run of dripline at the curb in front of the house. He’s directing Darynn, who is outside the shot. At the front walk, Mikel digs out a lateral line that was severed by the form used to construct the concrete pads. Working under one of the concrete walkway pads, Mikel cut the severed line cleanly to add a new elbow and flexible water line that he ran out to the sprinkler head that was cut off from water when the water line was severed. 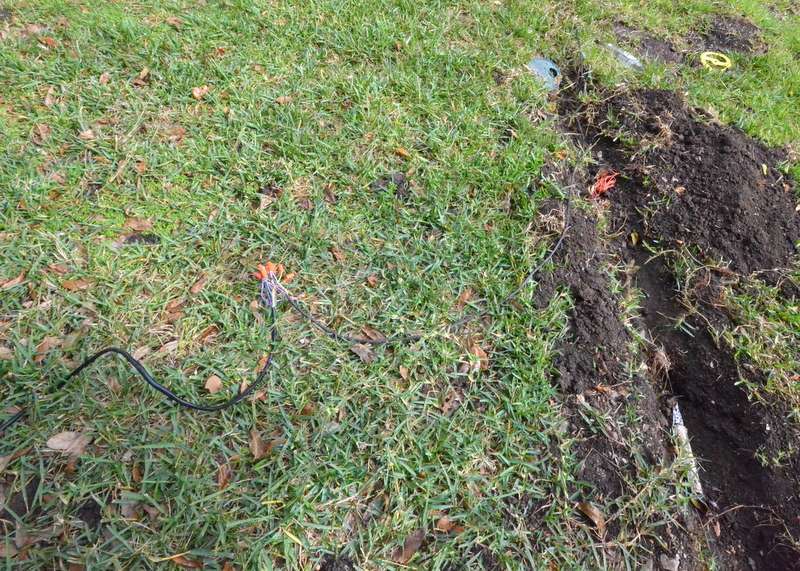 This is the main dig in the front yard where the plumbers originally severed the sprinkler lines when they trenched to install the new water supply line between the house and city water supply at the curb. 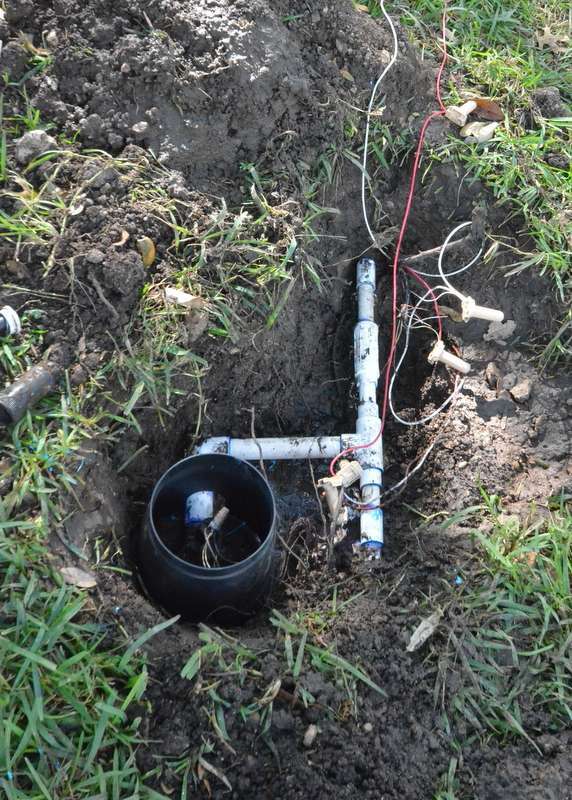 Valve 1 is the valve that the plumbers buried under several inches of dirt — discovered by Mikel when he explored for leaks in episodes 1, 2 and 3. 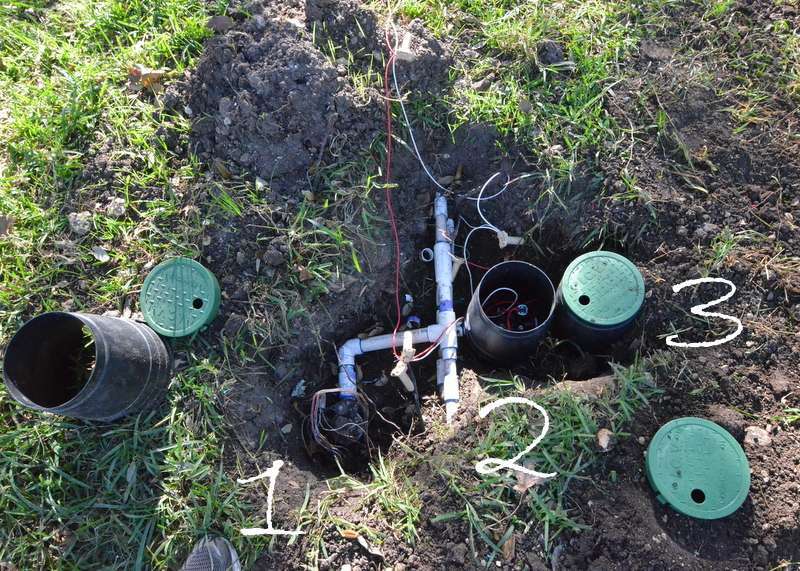 Valve 2 is a new valve that supplies water to the new drip zone along the curb. Inside housing 3 is a dripline pressure regulator. After about an hour of testing all possible wiring configurations, Darynn, who is studying to be an engineer, concluded that there is a cut in the wire that cannot be located — and the only way to electrically open and close valves is to install an Add-A-Wire device that enables the controller in the garage to “multiplex” different signals to different valves while using the same control wires. This little widget adds $200+ to the cost of the day’s gig. 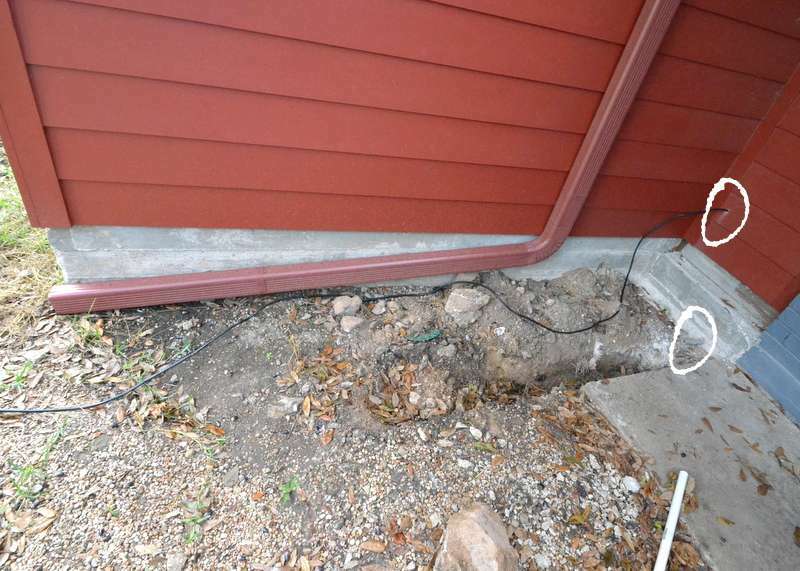 The alternative is several hours of manual trenching to run a new wire from the garage, to every valve, from the back of the house to the front. Darynn wires in the Add-A-Wire device. 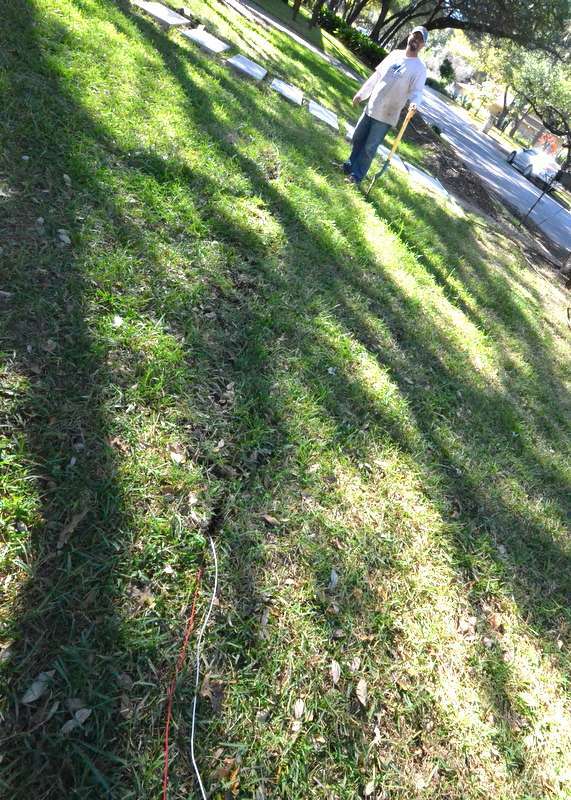 Mikel shifts a spray head from the curb at the street about eight feet back and into the lawn, where it can reach the grass, instead of spraying water into what will be a new planting bed that will be served by dripline. 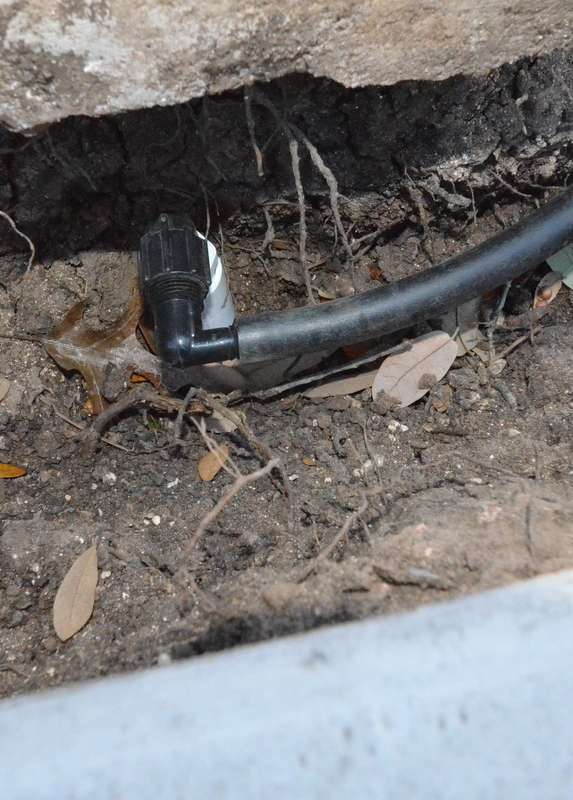 In the 30 November installment of the sprinkler saga, Mikel from Green Tree Professional returned to continue resurrecting the sprinkler system from construction damage. He blocked six hours, believing most if not all of the damage was already identified and repaired. 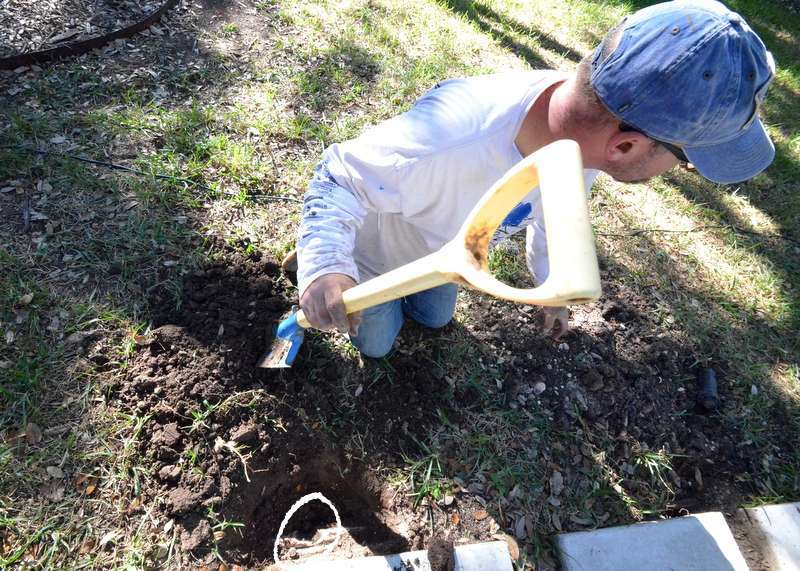 His goal was to begin redesigning the system to cut off lateral lines and sprinkler heads along the front of the house where planting beds no longer exist, and to lay out new drip lines to water the oaks in the front yard and planting beds that will be added to Emerald Hill. 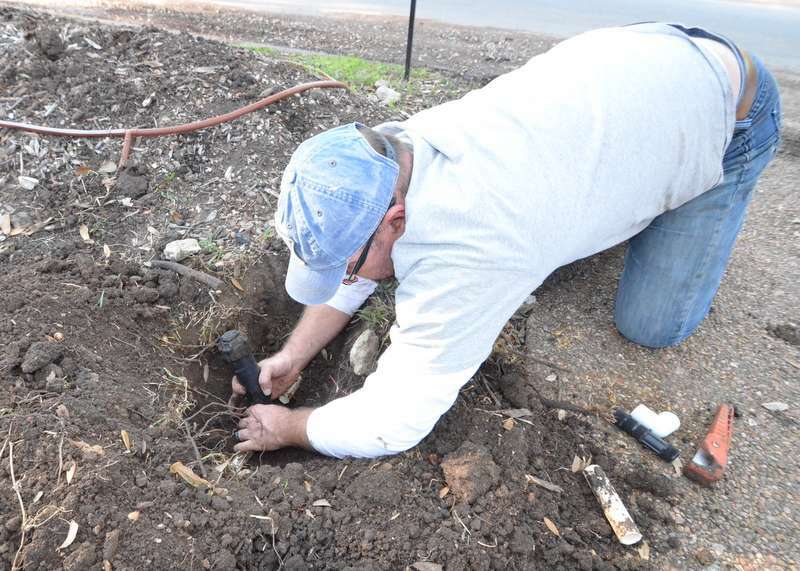 Mikel unspooled several hundred feet of drip line. 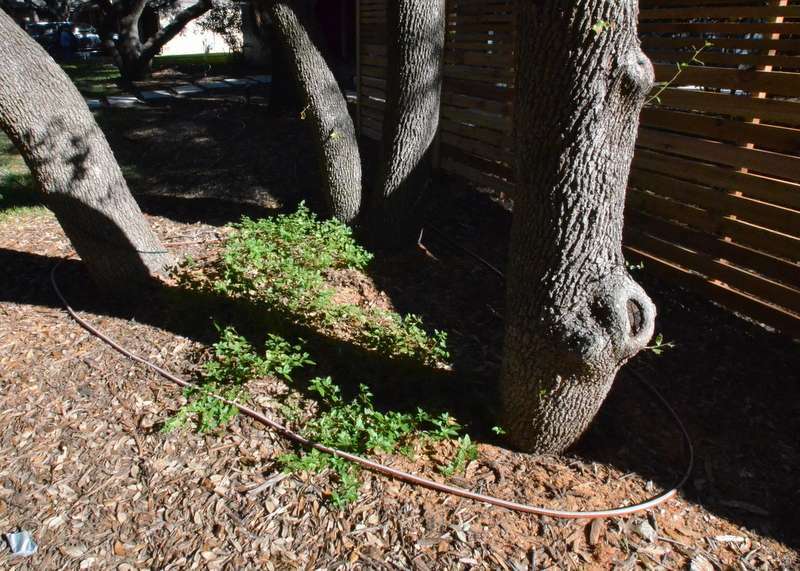 He looped some of the drip line around one of the oaks and into what will be a planting bed. 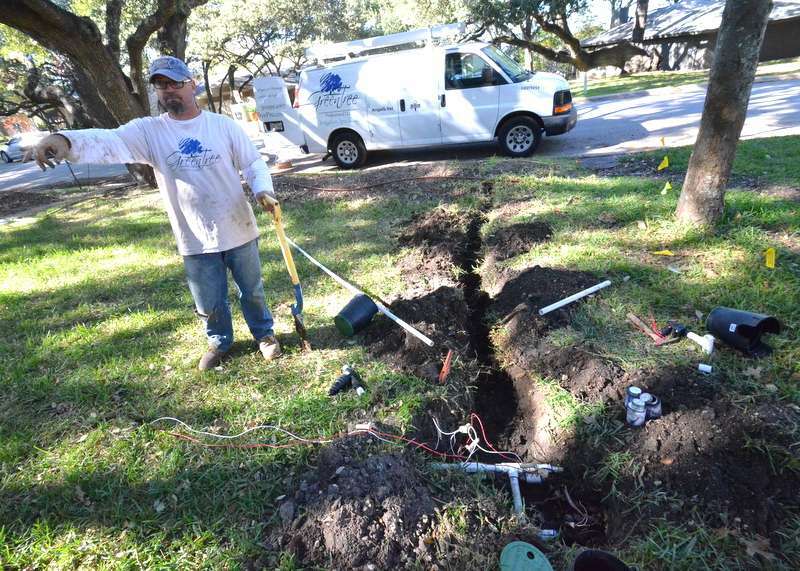 He looped the drip line around more of the oaks. 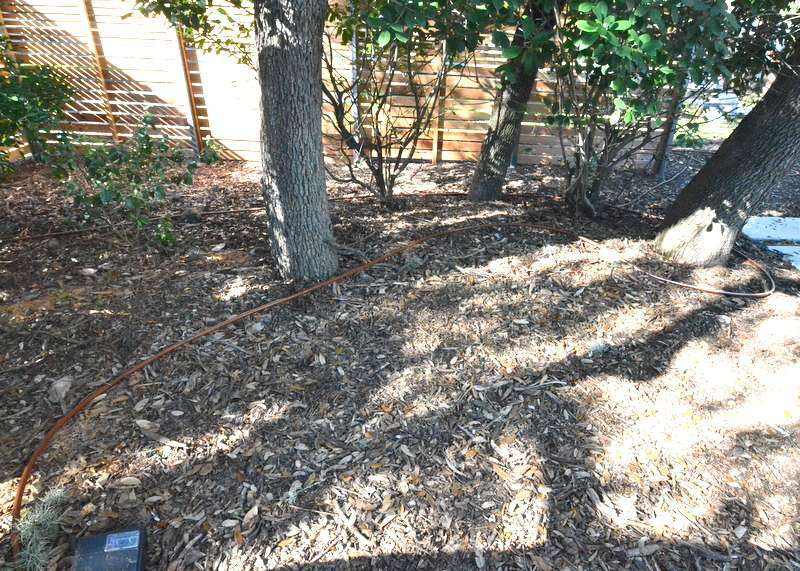 He continued around a cluster of oaks near the driveway and in front of the new privacy fence. He laid out a drip line that Steven will use for a future planting bed at the side of the deck at the kitchen side of the house. He looped the dripline around a cluster of oaks behind the new privacy fence. 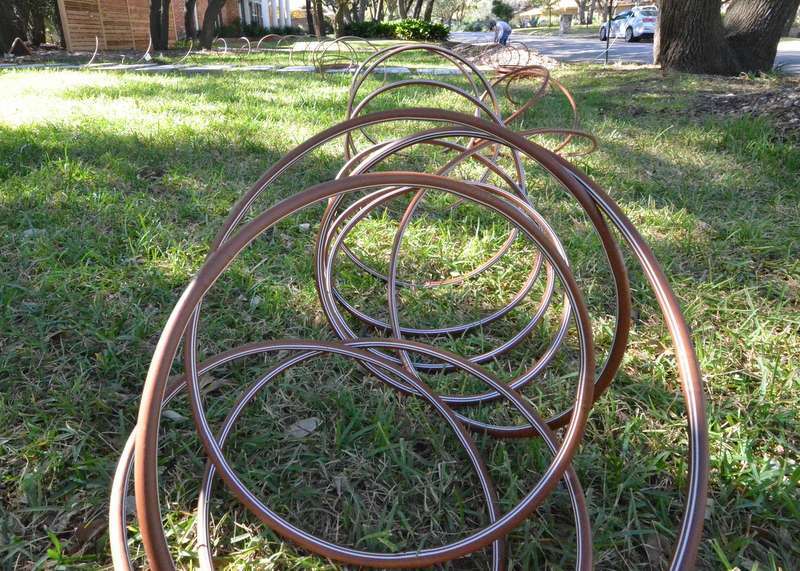 And he deployed several parallel runs of dripline across what will be new planting beds along the front curb. With the driplines laid out and staked down, Mikel switched on the water and activated the zones at the controller, to test the system. He discovered a broken line that no one knew existed at the end of the new fence line up the driveway. 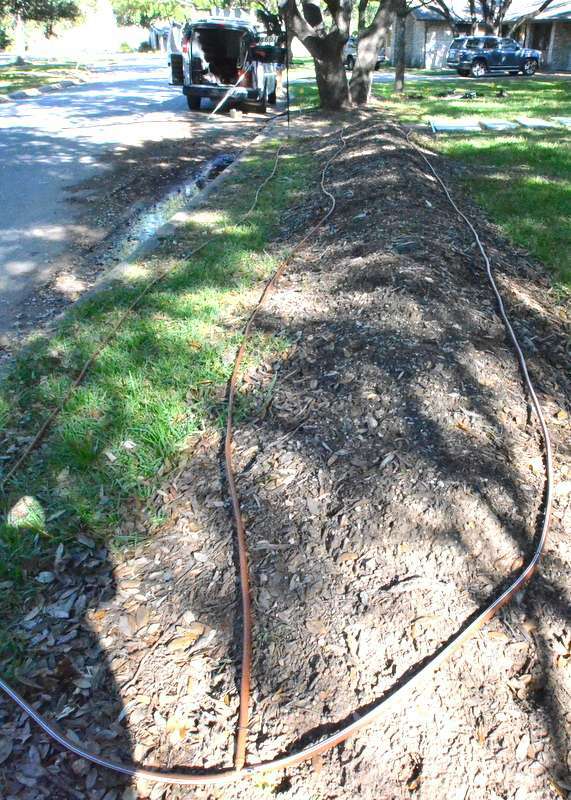 Water streamed from a severed lateral line that was buried under several inches of mulch. 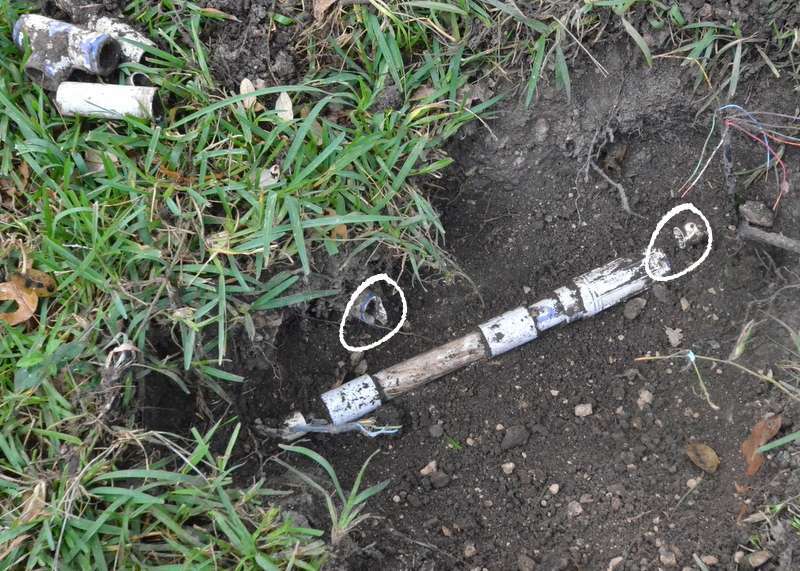 He extracted from under the mulch a brass spigot attached to what was the end of the severed pipe. Mikel cut the pipe clean and capped it. 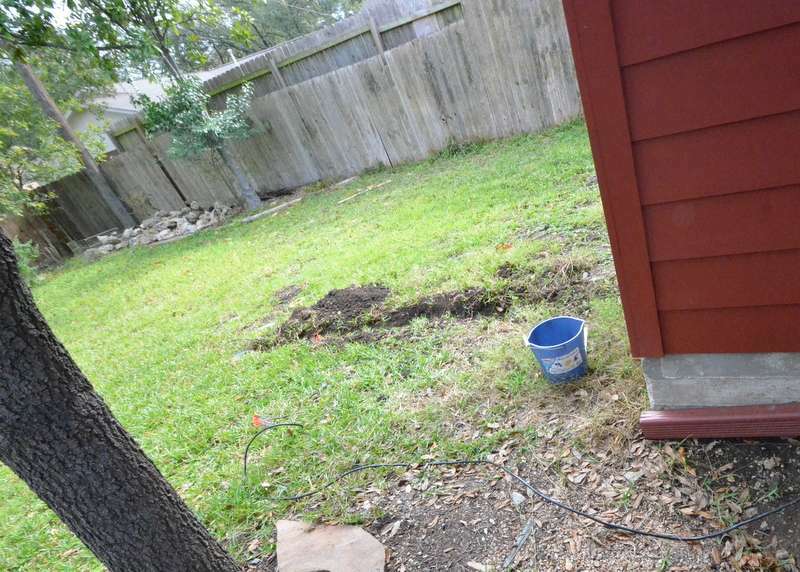 With that line fixed, Mikel switched the system back on — and there was now enough water pressure in the line to reveal four sprinkler heads buried under the mulch around the oaks behind the new fence. He removed the heads and capped the line. 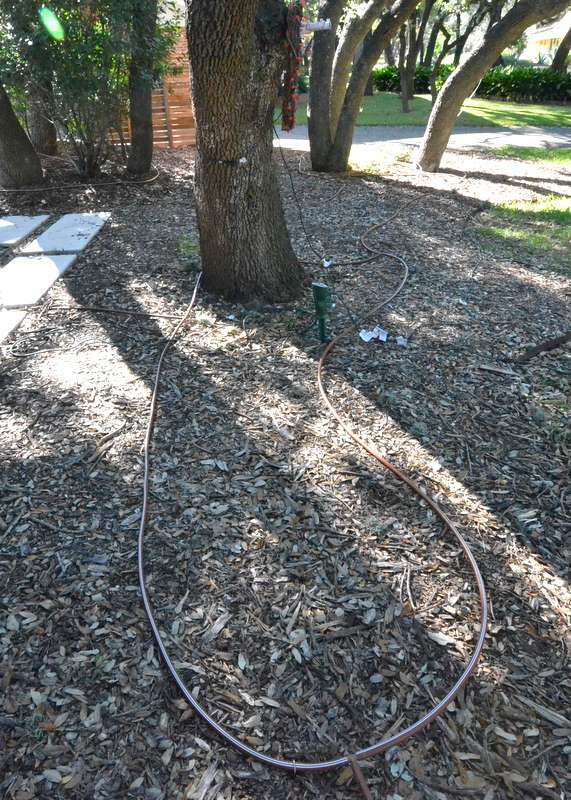 And … if we had known this run of sprinklers existed, he could have used it to supply the dripline around the trees — coulda woulda shoulda but too late now. 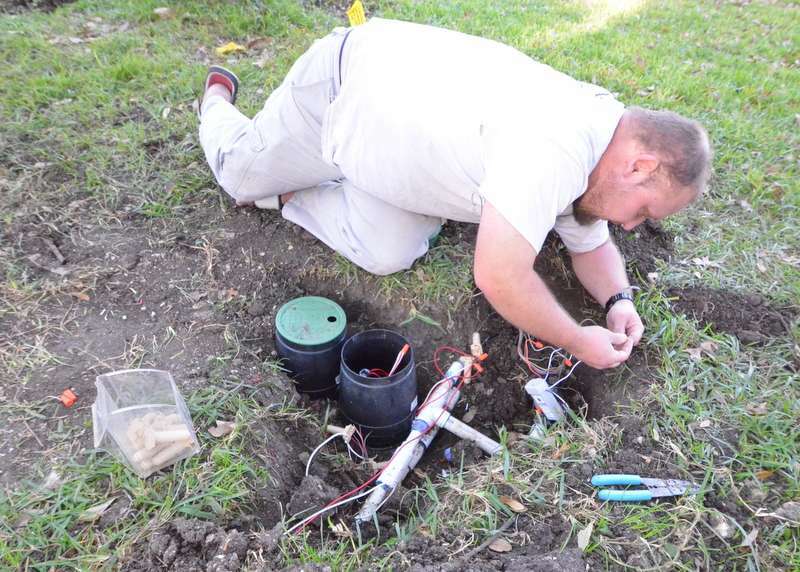 Next, Michael slit-trenched the new control wires into the ground between a valve at the walkway and the valve that the plumbers buried.